Over the past 2 weeks I have been in Port Vila, Vanuatu in the South Pacific with James Leach and Lissant Bolton (Keeper of Africa, Oceania and the Americas, British Museum) working with the Vanuatu Kaljoral Senta (Bislama for Vanuatu Cultural Centre). 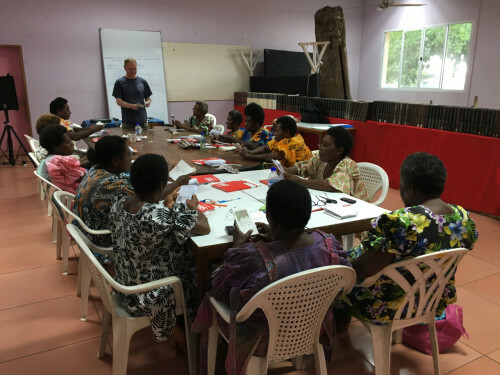 Lissant organised and led a special workshop with a group of women fieldworkers on the theme of current changes to kinship systems (supported by the Christensen Fund). The fieldworkers are ni-Vanuatu (local) people representing some of the many different vernacular language groups from across the many islands who do voluntary work to record and preserve traditional culture and knowledge. 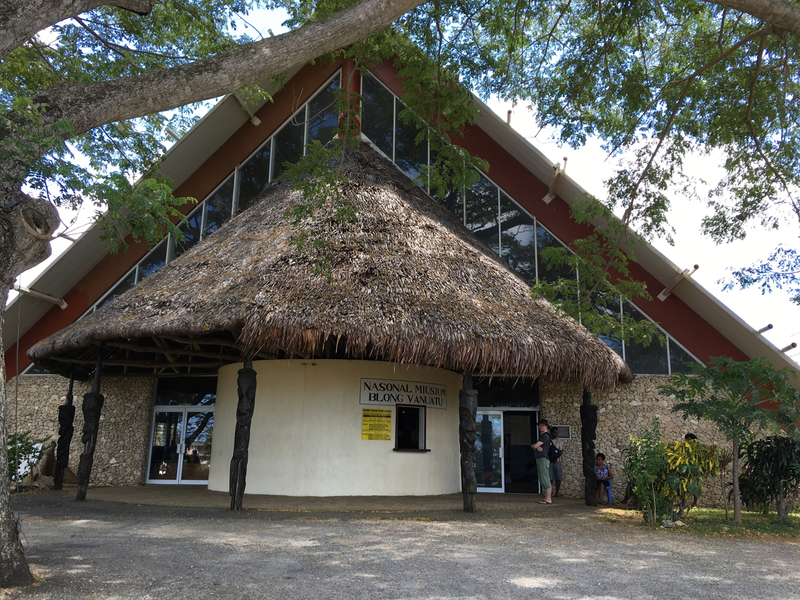 The fieldworker programme has been established and overseen by the Cultural Centre (VKS) for over 35 years and is a unique initiative where local people gather “cultural knowledges about all the aspects of the customary art of living of Vanuatu”. Each year the fieldworkers gather together to share their research with each other and contribute to the documentation held at the VKS. Lissant had invited James and I to visit Vanuatu with her and introduce the TKRN toolkit and techniques to the fieldworkers participating in the kinship workshop, as well as to meet with others working on different projects at the VKS. The low cost and ease of use of the TKRN booklets – both for collecting documentation in rural settings as well as digitising and archiving (both online and as hard copies) – made it an obvious tool to share. Prior to leaving London, Lissant and I had made some initial examples of Bislama (the local pidgin) notebooks for Vanuatu similar to those created in Tok Pisin for Papua New Guinea. These would be tested with the women fieldworkers during the workshop and we planned to adapt them with their assistance, as we have done in PNG with local people from Reite village. In Port Vila James and I were also were introduced to Paula Aruhuri of the Vanuatu Indigenous Land Defence Desk, an organisation that promotes awareness of indigenous custom and land rights across Vanuatu and campaigns to stop land alienation from traditional owners. With Paula we co-designed a simple reporting notebook for the fieldworkers who deliver awareness events to local communities that will assist the land desk in documenting local people’s concerns and how they might be able to help them. And we met with Edson Willie of the VKS Akioloji Unit (Heritage Unit), with whom we co-designed a notebook for fieldworkers to record heritage sites. The women fieldworkers experimented with one of the notebook formats and helped us re-design the front cover and write up a more appropriate ethics statement that reflected their different concerns about sharing traditional knowledge. In this case they chose not to share their books online (as we did in Reite), but to have them scanned, re-printed and stored in the ‘Tabu Rum’ of the VKS, the audio-visual archives. Local concerns about rights to aspects of traditional knowledge in Melanesia are a major theme and extremely important to design for. Developing tactics and a strategy to enable clear documentation and permission for sharing has been at the heart of the TKRN co-design process. Lissant has written about this issue in the context of Vanuatu and it also reflects on James’ work with Porer Nombo from Reite on their book Reite Plants in this essay. We are planning to return to Vanuatu later in the year with some Reite people to participate in a knowledge exchange around the TKRN toolkit and techniques with men and women fieldworkers of the VKS. In this way we hope to develop a model of adoption whereby communities learn from each other how to use and adapt the toolkit for their own purposes, with our role being more one of facilitation than education or training. As a toolkit designed from the grassroots up, I hope to continue expanding on the concept of ‘public authoring’ that has driven the development of bookleteer and the ‘shareables’ it enables people to make and share. In late April James and I will return to Papua New Guinea to work with Reite villagers to introduce the TKRN toolkit to a couple of other villages in Madang Province – this should provide an good indication of the possibilities and limitations of how a model of community knowledge transfer and adaptation can work.